There’s some recipes that can make you feel good when you just think about them. A hearty stew; old recipes your mother used to make; your favourite pie; and of course cakes. They make you feel welcome and embraced by happiness. There are several that I think very fondly of, but one that does it for me every time is Pineapple Upside Down Cake. There’s something about sweet pineapple, brown sugar and sticky, fluffy cake that feels like a warm blanket around the soul. 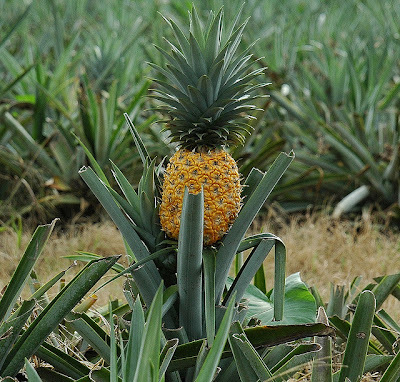 But for quite some time the pineapple was not a commodity that was available or affordable in the everyday kitchen. Pineapples originally were only present around the Caribbean, but with the arrival of European trade/exploitation migrated in all directions. Upon reaching the tables of the elites in Europe it quickly became a symbol of affluence and (upon what we would call “showing off to friends”), therefore hospitality. In Colonial America the idea of hospitality was a central theme as European settlements were small and far apart. One way to express hospitality was through visual symbols. 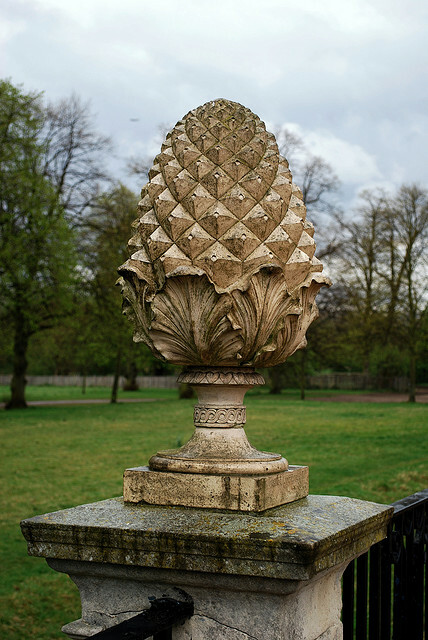 The pineapple became such a symbol of hospitality that it was reproduced in architecture. Pineapples were carved into doorway pediments and made into garden urns. They also were used in fabrics, silverware, furniture inlay and a multitude of other items. 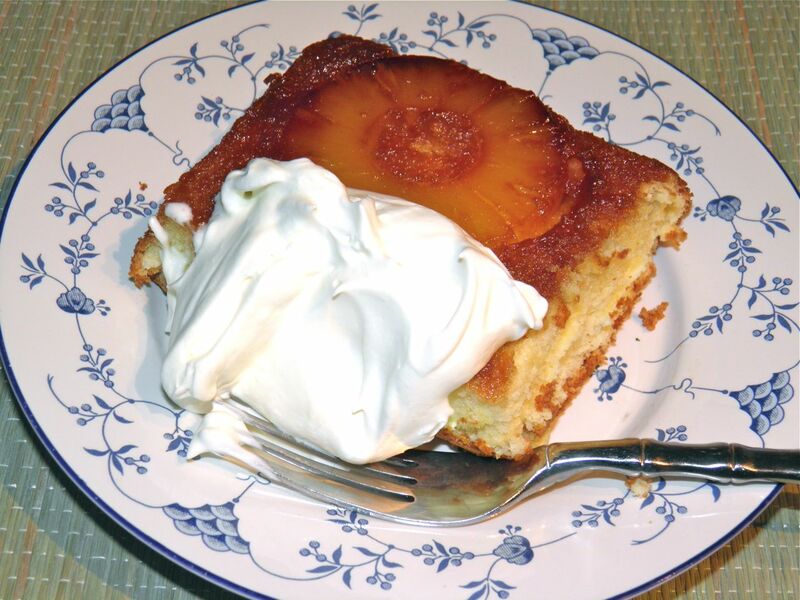 You may be surprised but upside down pineapple cake has only been with us since the invention of canned pineapple by Robert Dole (of the Hawaiin Pineapple Company, now Dole Food Company) in the early 1900s. Before that time, transportation and storage still kept pineapple as a bit of a luxury. The technique of placing fruit underneath batters was a cooking practice since the middle ages. It was usually done in a skillet and then flipped out to serve, not only to take advantage of collected juices but also to show the cooked fruit on the bottom. This particular cake hit its heyday in the 1920s. Dole asked for submissions on how to use its new pineapple rings for inclusion in a pineapple cookbook. Of the 60,000 submissions received 2,500 were for upside down cake. Published in 1926 the cookbook contains a recipe for "Upside Down Cake," from Mrs. Robert Davis of Norfolk Virginia.They then ran a national campaign using the cookbook which solidified the cake’s place in the American consciousness. It stayed in the forefront of the modern kitchen's desserts until waning in the 1970s. This was partly due, I believe, to the "back to the land" and healthier eating ideas stemming from the 1960s. This cake will not rattle your teeth. This cake is not one that has an overabundance of brown sugary sauce. If desired, add half again to the butter and sugar (3/4 cup butter and 1 cup sugar) in the first step. That white stuff is whipped crème fraîche. Place the butter in a 9” x 13” pan and allow to melt. Remove the pan from the oven and stir in the brown sugar. Mix until well blended. Arrange 8 pineapple slices evenly on the bottom of the pan. You should have the rings centred in 8 imaginary cut cake slices. Sprinkle lightly with a pinch of salt. Separate the egg yolks from the whites into separate bowls. Beat the whites until soft peaks form. Set aside. This is "soft peaks." If you flip the whisk up the peak will droop. Mix the flour, baking soda and salt together. Set aside. Add the sugar to the egg yolks and beat on high speed until thick and yellow coloured. Then add pineapple juice and almond flavouring. Incorporate the flour mixture into the egg yolks and sugar. When blended, quickly re-beat the whites. Then fold the whites into the batter with a spatula. * Folding in the whites helps lighten the batter and helps the cake rise in the oven. Pour the batter over the pineapple rings and spread out evenly. Bake in the centre of the oven for 40-45 minutes, or until a toothpick inserted in the cake comes out clean. 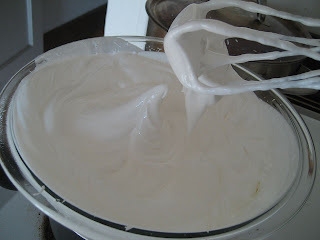 * To fold egg whites into batter place 1/3 of the whites in the centre of the bowl with the flour batter. With a spatula, bring the batter up over the whites and cut the whites down into the flour batter. Rotate the bowl and they will slowly become incorporated. Add the remaining 2/3 of the whites and repeat. Doing it this way retains their lofting ability in the batter. Do not just beat in or you will deflate them. Let cool slightly. You can flip the entire cake onto a long tray if you wish. Serve with whipped cream (or whipped leftover crème fraîche posted earlier in the blog).